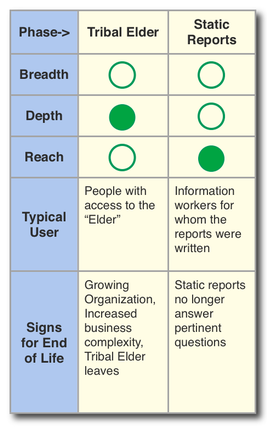 As we go through the different stages, we’ll discuss the breadth (how wide is coverage of all available information), depth (how deep is the understanding about covered information), reach (how easy is the access to the covered information), the typical user of the analytics method, and the signs that the organization is outgrowing each phase in the model. So, without further ado, let’s get started. The earliest stage of analytics maturity is one in which the organization relies entirely on the expertise of one or two individuals who use their business savvy to provide analytics. These folks, we’ll call them Tribal Elders, have been around the company for a long time and have "seen it all." Just like the those "elders" in the movies, they’re wizened leaders who can mash all the data in their head and join it with their experiences to make good decisions. I guess you would say that technically, there are no formal analytics that are performed during this stage. However, everyday, the expert is using their training in the school of hard knocks to observe, analyze, act and advise on what they know to be the best for the business. An organization outgrows this phase when the business becomes complex either through growth or through changing environment (such as variance in market conditions, or the expert leaving the business). All of a sudden, the leaders find themselves in a situation where they can’t scale the decision making quickly enough to continue to drive the business. The huge asset of the expert’s experience has turned into a liability that acts like an anchor on the organization’s maneuverability. An organization has reached the second phase when they have realized that they have outgrown their ability to rely wholly on what they can get out of the Tribal Elders to run the company. So they start to write down all the questions they normally ask. They use this list to start to build reports that that can provide answers to those questions that they know. Once completed, the organization now has the ability to enable a broad audience to answer the questions that have been asked on a regular basis. On the other hand: Surprise! The limitation of this approach is that the Tribal Elders are still needed to answer the questions that fall out side of the standard "what I know to ask" category. The beginning of the end of this phase happens when an event that was unforeseen occurs that dramatically and negatively impacts performance. The logical question arises "why didn’t we see this coming?" followed by the answer "we didn’t have that data." The organization then begins the transition to Phase 3. Next time we’ll discuss the remaining three phases of maturation.